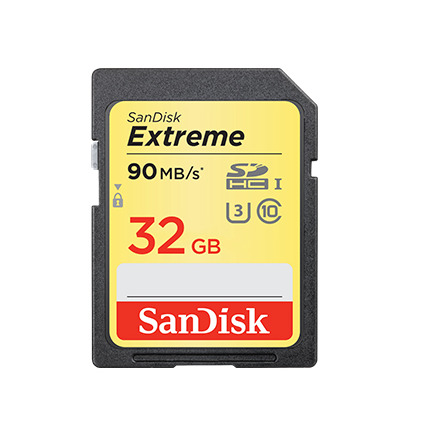 The 32GB Extreme UHS-I SDHC Memory Card from SanDisk allows users to take advantage of functions such as fast action shots, continuous burst mode, and multiple frames per second. It features a capacity of 32GB, is compatible with the UHS-I bus, and delivers maximum read speeds of up to 90 MB/s and maximum write speeds of up to 40 MB/s. This Extreme UHS-I SDHC card supports the V30 speed class, which guarantees minimum write speeds of 30 MB/s. If your device does not support the V30 speed class, this card also supports the U3 speed class, which likewise guarantees minimum write speeds of 30 MB/s. If your device only supports the Class 10 standard, minimum write speeds are guaranteed not to drop below 10 MB/s. Extreme speeds to catch your best shots. UHS Video Speed Class 30 (V30) and UHS Speed Class 3 (U3) allow you to record in 4K UHD, taking your videos to next-level resolution. With read speeds of up to 90MB/s, these cards are compatible with SDHC supporting devices. Capture shots quickly with write speeds of up to 60MB/s. SanDisk Extreme SDHC UHS-I Cards let you shoot multiple frames per second, making it an ideal choice for fast-action or continuous burst mode photography. With UHS Video Speed Class 30 (V30) and UHS Speed Class 3 (U3) ratings, the SanDisk Extreme SDHC UHS-I Cards let you capture uninterrupted 4K UHD and Full HD video. This makes it ideal for recording outdoor adventures, weekend trips, or sporting events without dropping frames. SanDisk Extreme SDHC UHS-I Cards are shockproof, temperature-proof, waterproof, and X-ray-proof, so you can enjoy your adventures without worrying about the durability of your memory card.